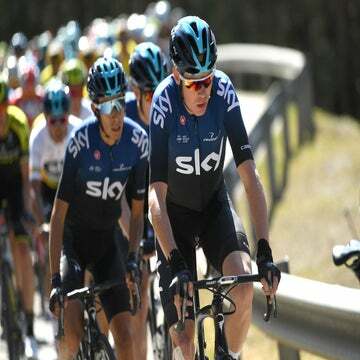 MADRID (AFP) — Chris Froome’s hopes of winning the Volta a Catalunya are almost certainly over after he suffered a crash during Tuesday’s stage 2, which was won by Australian Michael Matthews. With less than 40 kilometers to go, four-time Tour de France champion Froome fell along with Bora-Hansgrohe duo Andres Schillinger and Jay McCarthy. Froome, who is racing for the first time since his season debut in January, was left with a nasty gash down the top of his right leg. The right shoulder of his jersey was also torn. An initial press statement by Team Sky did not indicate that he had suffered any significant injuries besides road rash. The Brit leader ended up losing 14:04 in Tuesday’s stage, effectively ending his chances in the race for the overall. Coming into the race, fans and media were anticipating a showdown between Team Sky’s GC star and Movistar duo Alejandro Valverde and Nairo Quintana. That, unfortunately, will not take place this week. The crash sets up Sky’s Colombian phenom Egan Bernal as the team’s key GC leader going into Wednesday’s stage 3, which heads northwest into the mountains finishing at the resort of Valter 2000 after a long, difficult Pyrenean climb. Bernal was well-protected by his team in the stage 2 finale, but that meant that Froome had to fend for himself after crashing. “We could not ask another one of our guys to wait [for Froome] because we knew if we did this we’d have two riders less on the final climb,” Portal added. 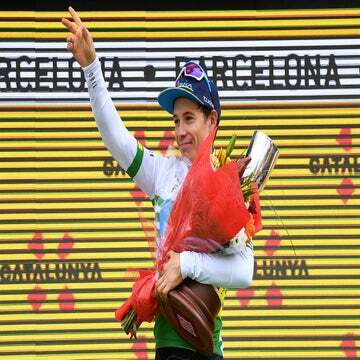 “Today it was really important for Egan [Bernal] to have that support. It was a technical finish and we knew there could be some splits. Froomey said himself for the guys to stay at the front. Obviously, we will monitor him but it seems like Froomey is okay.